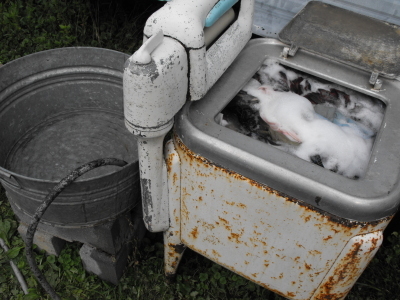 The wringer washer is working again with a small leak, which is a bit smaller than before. I think silicone was a bad choice for this problem due to the nature of the metal in question, but I went for it because it's what I had on hand. Next time I think I'll take john wilson's advice and use some of that fiberglass bondo stuff when trying to merge this type of metal with a hard plastic.